A powerful and authentic testimonial can turn even your most skeptical visitors into action-takers. It can instantly boost your credibility and tip the scale to convince prospects to subscribe, click, visit or even buy. This is how I used to feel everytime I’d reach out to client for a testimonial. Usually I’d reach out when a big marketing project was coming up, like the launch of a new website or product. It turns out, that’s too late. By the time they finally got back with me (after the several awkward follow up emails), the project had already launched. But things are different now that I’ve implemented an automated system that pretty much handles everything for me. Today, I have more testimonials than competitors 2 or 3 times my size because I have a system that consistently asks for client feedback. I’ve learned that collecting feedback and testimonials should be part of an ongoing marketing system. It shouldn’t be a one-off effort when there’s a project deadline due. As you keep reading, you’ll see how I use automation (but not too much) to solicit feedback and testimonials and then use that momentum to ask my happy clients for reviews on Google and Facebook. I’m not saying this is the ONLY way to do it. In fact, I’ve seen some other creative ways businesses have gone about gathering testimonials and online reviews, but this process works for me because…well, I’m BUSY and I’m sure you are too. This post will walk you through the process of automating the testimonial experience in your business by using the Infusionsoft campaign builder. 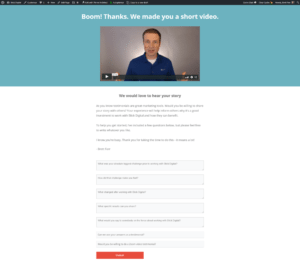 This one doesn’t really have anything to do with setting up Infusionsoft or automation, but it’s a crucial part because it creates a story for your customer to share. Good marketing is good storytelling and creating a memorable experience allows your customers to easily share their experience. We’ll call on that experience when it comes time for us to ask for a testimonial. In Seth Godin’s Book Purple Cow, he reiterates again and again that “If people aren’t talking about you, there’s a reason. You’re boring – your products are boring, your services are boring, your message is boring, your marketing is boring . . .” If this feels like your business, take some inspiration from companies like Geico, Blendtech and Dollar Shave Club. These businesses provide great marketing and great experiences, even in ‘boring’ niches and industries. Use the purchase goal or an internal form to trigger a welcome campaign in Infusionsoft. Include emails, postcards, letters or phone calls to make sure your customer feels the love. Note: Way too many people talk about how great marketing automation is for your lead follow-up, but almost no one talks about the benefits you’ll realize when using it for your client follow-up. Infusionsoft is great at automating the process of segmenting which customers had a good experience and which ones did not. The reason for this step is to make sure we only ask those who’ve had a positive experience to leave a testimonial and review. Use radio buttons or dropdowns in addition to your free text fields, so you can automate the following steps easier with decision diamonds and tags. It’s up to you to decide what constitutes a positive experience. For us, it’s anyone who clicks the ‘happy face’ in the email above. If they answer with a ‘meh’ or ‘frowny’ face, we’ll send them to a basic landing page that asks how we can improve. If a client clicks the ‘happy face’ in the email above, they’ll be directed to page with a video thanking them and asking them to answer a few very specific questions. We intentionally ask the following questions to help guide their answers so that we can use them in a meaningful way. What was your absolute biggest challenge prior to working with Blick Digital? 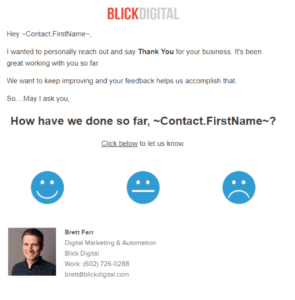 What changed after working with Blick Digital? Before we implemented this, we’d get testimonials all the time like, “They were so awesome to work with” or, “Thanks for the great work”. While those were great and helped boost our ego, they didn’t tell a story or help our prospects understand everything we could do for them. The final question we ask our clients on this page is if they are willing to record a short interview video with a simple Yes/No dropdown. If they answer yes, Infusionsoft will follow up with them later to schedule a time, using AppointmentCore, where we can meet using Zoom. Zoom is a software that allows us to share webcams and record a short interview case study with the client. We keep this pretty casual and laid back. We’ve found that most of our clients who complete the questions actually agree to this Zoom video meeting (it’s awesome!). As soon as the client answers the questions and submits the form, we direct them to a thank you page that asks them to leave a review on Google or Facebook. The momentum is building at this point, so we continue to make it easy to leave a review. On the thank you page, we include their answers to the previous Storybrand questions (as merge fields). All they need to do at this point is copy and paste their answers into Google or Facebook. Easy. As with any process, it’s important to review and improve based on what you learn. This process isn’t perfect and we’re constantly updating and improving it based on its performance. In fact, what I’ve shared today is the 4th iteration on this campaign. I also understand that every business is different. For example, if you’re a local service provider, you could easily modify this process to focus more on reviews (which are gold for your type of business) than testimonials, if that’s what you’d like. If you take the time to implement this system, I’m confident you’ll see some great results. Your new problem will be wondering where you should showcase all the amazing testimonials you’re receiving. Is there anything I missed? What would you add? Leave a comment below. Brett is the founder of Blick Digital, a marketing automation agency. He’s an automation nerd, a top ASU Marketing graduate, and was honored to be the TIME Person of the Year in 2006. He’s half Australian, grew up on an island and now calls the Arizona desert his home with his wife and two kids.